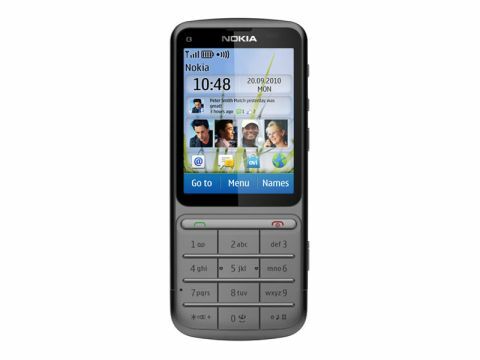 The Nokia C3-01 Touch and Type is a candybar handset with a small screen and a simple numeric keypad. Like its near-namesake the BlackBerry-alike C3-00, the C3-01 Touch and Type is designed to be a low cost, easy to use messaging fan's handset. It will set you back £150 SIM free, so it isn't exactly going to break the bank, but for that kind of expense you do want a bit more than a pocket-money toy. In many ways, it's reminiscent of the Nokia 6700 Classic, which we thought was, well, a classic handset from Nokia. No touchscreen there, but it had the sane metallic candybar design and screamed premium. As its name suggests, the Nokia C3-01 Touch and Type brings touchscreen sensitivity to this most basic of handset formats. If you want simple messaging, a little Facebook and Twitter action and a handset that neither weighs you down nor requires a degree in User-Interface-Onomics to get to grips with, then the Nokia C3-01 Touch and Type sounds on paper as though it could be your best pal. But that ain't necessarily so, as we'll see later. First, though, let's look at the physical design, which is really good. The use of metal in the chassis, most notably for the backplate, lends an air of solidity to the feel while also giving the innards a reasonable amount of protection against drops and knocks. The rounded edges and curved corners help the phone feel comfy in the hand, and its overall size of 111 x 47.5 x 11mm and its weight of 100g mean it's easy to drop into all but the very smallest of pockets. Nokia has thought carefully about side buttons and connectors, too. The bottom and left sides are completely clear. On top, there's a headset connector, micro-USB connector and the small round plug for charging the battery. On the right side is a volume rocker, screen-lock button and camera button. While you won't find a smartphone-like cornucopia of features here, the range is reasonably solid. There's 30MB of built-in memory and a microSD card slot under the backplate. Wi-Fi and Bluetooth and 3G are on-board, but there's no GPS though and the operating system is S40 6th Edition (ie enhanced for touch).